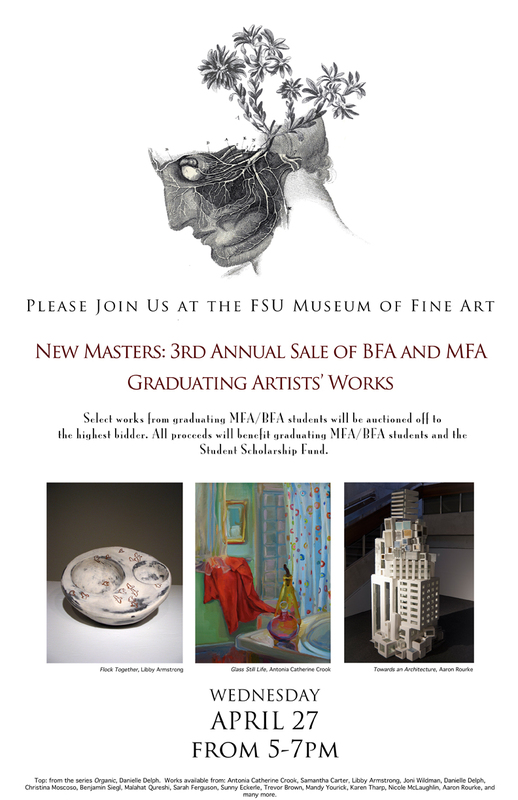 FSU’s Department of Art presents the “3rd Annual New Masters: MFA/BFA Graduating Artists’ Work Sale” hosted by FSU’s Museum of Fine Arts. The event will be held on Wednesday, April 27, 2011 from 5 until 7 PM. This event occurs at the close of the MFA/BFA student graduation exhibition that runs from April 8 – 28, 2011. Additional artwork will be brought in for the sale on the 27th! The museum will be open for pre-viewing artists’ works from 9 a.m. until 4 p.m. on April 27th. The 3rd Annual New Masters: Graduating Artists’ Work Sale will be a catered event with 100% of the proceeds going to the students and the Student Scholarship Fund. Come check out the student work and take an original artwork home with you during this once-annual opportunity. There will be drawings, paintings, sculpture, photography, ceramics, digital prints, and other work to choose from. Come support these young artists before they leave FSU! All events is free and open to the public. The Museum of Fine Arts is located on the campus of FSU at the corner of Copeland and Call Street in the Fine Arts Building. There is a parking garage conveniently located next to the museum.